I frequently hear people complaining about work and what they do for a living. The first and easy response from many of you would be to say to these folks, “go find another job”. That’s great in theory and sounds like a practical solution. The problem is that many of these people will feel the same way in their new job within months. In many cases the issue isn’t the job or the task at hand, it’s the person’s attitude and their perception of the job. To use a golf reference, “it’s the Indian not the arrow”. It’s also somewhat of a self-fulfilling prophecy, they’re constantly complaining about their job and the universe happily complies by delivering many reasons for them not to like their job. It’s a viscous cycle which only grows uncontrollably if they don’t make the required change. The issue is many don’t know where to start, or worse, they don’t even see their attitude as the problem. The first step, is to begin by changing your attitude to one of gratitude. Be happy that you have the opportunity to work, regardless of how much you get paid or even what you do. You must begin from a place of gratitude, you need to truly give thanks that you have the ability to work and that you are employed. This step automatically shifts your focus and will inject a much needed shot of positive energy into your life. The key is to revisit this place of gratitude when you feel yourself reverting to negative thinking about your job or any situation. The second step is to acknowledge that your negative attitude towards your job may be the issue. This attitude, if left unchecked, will seep into other areas of your life and wreak havoc on your chances of success. It’s not easy, but catch yourself every time you venture into negative thinking. At first it will be a challenge but repetition will help this become second nature to you. Positive thinking is nice but nothing will be accomplished without “action”. Another key step is to focus your attention on the things and situations that are under your control. Stop worrying about how bad the economy is, when you don’t have an ounce of influence on how the economy performs. What you can impact is your personal economy. You can focus on doing better at your job, learning new skills or advancing your education so that you can better position yourself when the economy does come around. The next time you catch yourself worrying about something, ask yourself if you can directly influence the outcome of the situation. If you can’t, then stop worrying about it and begin focusing on what is under your control. One personal example I can share, about four years ago I caught myself complaining to my dad about a specific event that happened at my job that had me stressed. Nothing out of the ordinary just normal venting. I didn’t realize it at the time but he gave me a very valuable advice. He said: “When you work for someone, when you are their employee, work as hard as if you owned the business yourself. Treat the job with that same attitude.” I thought, okay that is an interesting way to look at it but it really didn’t sink in with me. His advice finally clicked for me when I read an article a couple of years ago in which the author gave a very special piece of advice. He mentioned that it doesn’t matter what your job is, you could be lawyer, a stock broker, a taxi driver, a sales guy or any other occupation; be the best lawyer, stock broker, taxi driver or sales guy you can be. He went on to say, whatever it is that you do for a living…think of yourself as the CEO of that position. That is your domain, own it! Be so great at whatever it is you do that no one can deny your greatness. Again, own it! Focus on doing the best that you can do. Stop comparing yourself to others. By comparing yourself you may be setting up unrealistic expectations which will lead you to disappointment and ultimately lead you down the road to negativity. What is realistic? Realistic is expecting to do better today than you did yesterday or doing better this year than last. Do your best to beat your best and the rest will take care of itself. If you haven’t already, start today, become the CEO of your life. 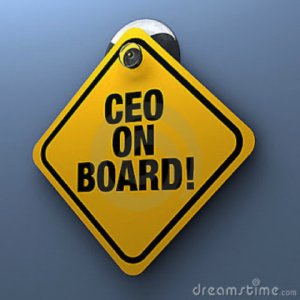 Begin to treat all the important areas of your life with the same discipline, energy and passion of a true CEO. The results will inspire you to continue to live this way. Cheers to your success!